Probably the worst piece of news you may hear today is that if MafiaWare Ransomware has infiltrated your system, you can say goodbye to your documents and images as this malicious program can take them all hostage. Supposedly, the only way for you to get your files back is to pay the demanded ransom fee. However, our experience in this field and user reports also indicate that there is hardly any chance for you to recover your files after this attack. Well, your only chance actually is that you have a backup copy saved on an external drive, such as a pendrive. There is yet another possibility, however small; malware hunters may find a way to crack this ransomware infection and upload a free application soon. One thing is sure though: You will not be able to use the affected files unless you have the decryption key. Since this key is kept on a secret server by the criminals who attacked you, there is little chance that you will ever get it from them. Therefore, we recommend that you remove MafiaWare Ransomware right away because otherwise you will not be able to use your computer. Let us tell you in more detail how this dangerous infection can end up on your computer and what you can do to protect your PC from similar threats. This malicious program is most likely to sneak onto your system via spamming campaigns. This means that the malicious executable file is posing as a text document, a video, or an images file attached to an important-looking e-mail, which is, of course, fake. Maybe you would never open spam e-mails and you think that you can identify one easily. You may also think that your spam filter is effective enough to prevent such a dangerous threat from landing in your inbox. However, this spam may be tricky enough to fool your filter and you as well. But even if it were to end up in your spam folder, there is a good chance that you would want to see its content since this spam can be rather convincing. For example, the sender may appear to you as someone you cannot just ignore or neglect. This can include authorities, prestigious companies (e.g., FedEx and AOL), banks, Internet providers, and so on. This spam can pretend to contain information that may be of high importance and urgency to you, including unsettled invoices, problems with a hotel room booking, issues with your credit card, and the like. This is how criminals try to make sure that you feel the need to open this mail and download the attachment to see what is going on. However, the bad news regarding ransomware infections like this is that deleting MafiaWare Ransomware will not bring your files back. But even so, you need to remove MafiaWare Ransomware because there is no other way to restore your computer. We have found that this dangerous threat is based on the well-known open-source project called Hidden Tear Ransomware family. There have been a number of infections in the past year that pose as variants of this ransomware, such as Payday Ransomware and Hollycrypt Ransomware to mention two of the more recent ones. This malware infection seems to use the AES and RSA encryption algorithms to encrypt your document and image files. These are built-in functions in your Windows OS, which means very fast speed to accomplish the vicious task. All your infected files get a new, ".locked-by-mafia" extension. When the encryption has finished, a text file named "READ_ME.txt" is created on your desktop, which contains all the information you need to know about this attack and your supposed way out of it. These criminals demand 155 dollars (0.18 Bitcoins) to be paid in Bitcoins to the given address. After you transfer the money, you have to write an e-mail to dompetpresiden@gmail.com with you transaction ID to prove that you have transferred this money. Then, the drill is that you are supposed to get the decryption key or a tool to recover your files even though this note does not mention any of this. You need to understand two things when it comes to paying ransom fees. One, by paying you would simply support cyber criminals to commit further online crimes and damage others. Two, it is most likely that you will get no decryption key and no tool either. The reason for this can be twofold. First, these criminals may have no intention at all to send you the key. Second, it is possible that these crooks need to shut down the remote server to cover their tracks and this would mean that your key will be lost forever. In any case, we do not recommend that you contact these criminals. Instead, you should delete MafiaWare Ransomware ASAP. This may be a rather dangerous ransomware infection, still, it is quite easy to eliminate it. We could say that it is as easy as ABC even if you are not an experienced computer user because all you need to do is locate and bin the malicious file you saved from the e-mail and ran. If you need assistance with this, please follow our instructions below. As you can see now, it is very important that you be more careful not to open questionable e-mails, let alone their attachments. It is just as important to keep all your programs and drivers always up-to-date from official or reputable sources to prevent cyber criminals from exploiting outdated software bugs and vulnerabilities. Nevertheless, the best protection for your precious files and your virtual world is to have a reliable malware removal program installed that can automatically nip any known malware attacks in the bud. Find and bin the malicious executable file (with a random name) that you saved and ran. 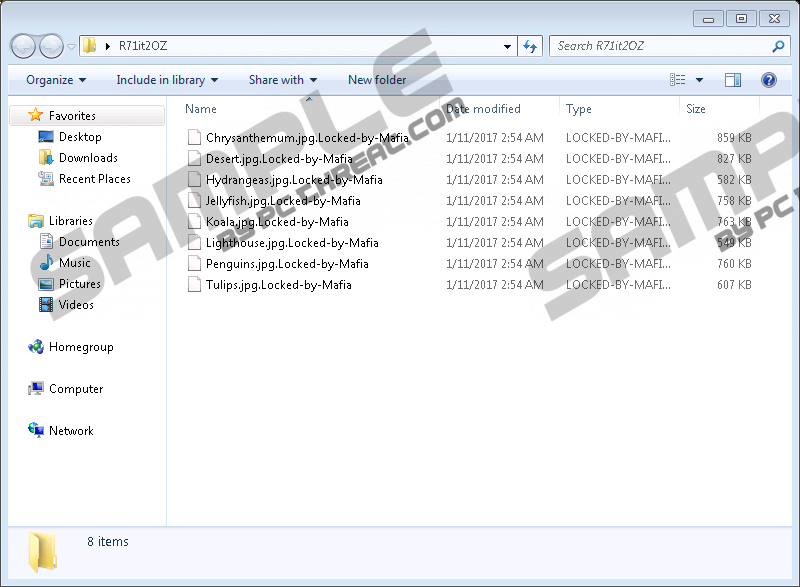 Quick & tested solution for MafiaWare Ransomware removal.